• Every 13.7 minutes, someone dies by suicide. • Nearly 1 million people attempt it every year. • Ninety percent of people who die by suicide have a diagnosable and treatable psychiatric disorder at the time of their death. And although most depressed people are not suicidal, two-thirds of those who die by suicide suffer from a depressive illness. • Even though effective treatments are available, only one in three depressed people gets help. Worldwide, suicide is among the three leading causes of death among people ages 15 to 54. The toll is higher than the total number of deaths each year from war and homicide combined. After losing her husband 14 years ago to suicide, Antoinette Steinbarth has made it her mission to try to spare others of the heartbreak she has weathered since. “In your brain, you think there should have been protection enough for losing him. The reality of it is, there’s nothing that protects you from losing someone. 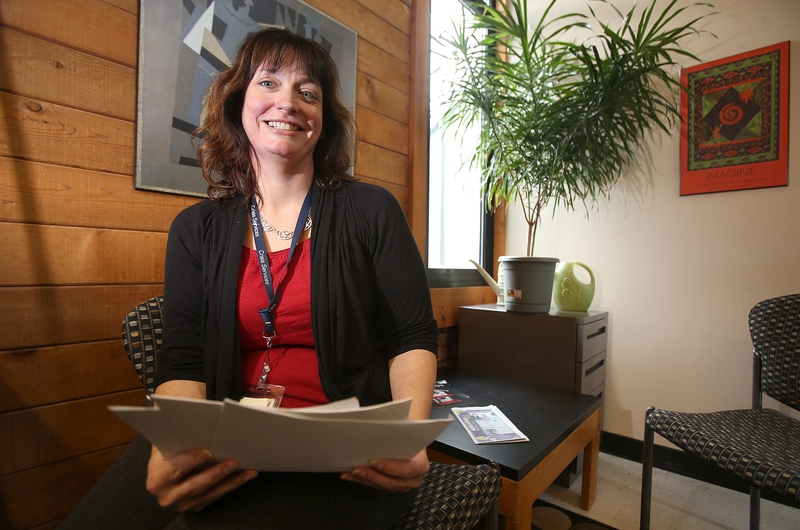 Bad stuff happens to good people,” said Steinbarth, 43, a licensed mental health counselor who for the last 2½ years has supervised the outreach team at Crisis Services in Erie County, an agency whose hotline handled more than 12,000 suicide-related concerns last year. Steinbarth worked in customer relations at the Eastern Hills Mall when she lost her husband, Andy, who had bipolar disorder, in 2000. Afterward, she went back to school for her master’s degree and now looks to help others reduce the prospects of an unhealthy outcome by being there for others when called upon in a crisis. Those in such spots – and their families – need to understand that there are several things the mental health community can do to diffuse such dilemmas, in most cases while the person in crisis continues to live at home. Can you talk about what you and your team do? We go out and assist those with diagnosed and undiagnosed mental health issues get linked with treatment and services. There are instances where we aren’t able to do that because their mental health issues have reached a point where they have to be seen at the hospital. We work under New York State Hygiene Law that allows us to involuntarily transport someone, although our goal is hospital diversion and helping people get linked with treatment and services. The psychiatric center has a lot of outpatient clinics, so we would either make referrals to them or other agencies, or they would be calling us when they have clients that aren’t doing well and they feel they might need some extra support. If there are clinics or family members concerned about someone with a mental health issue, we would be the most likely program that would be able to support the client, the family and the provider. Who tends to call the Crisis Services hotline? We have family members call, friends call, employers call. When family members or providers call, that’s usually the pattern. Most people are aware of the hotline – 834-3131 – which is the first gateway into the agency. … In a tough crisis, or if it’s looking like a crisis – so either suicide (risk) or their mental health symptoms are to the point where they’re not making the best judgments or decisions, and it’s definitely linked to a mental health concern – we would be the department where the hotline would transfer the call and information to, to determine what’s best. Can you talk more about the Crisis Services process? Calls come into our hotline and our crisis counselors. They’re going to get background information – make sure they’re in Erie County, because we only service Erie County – and more than likely they’re going to be immediately transferred over to one of my staff members. There is somebody available 24 hours, seven days a week. The goal is to keep people out of the hospital. There’s a change in regulation that requires outpatient clinics to provide access to a counselor 24 hours a day. The hospital is not for treatment these days, the hospital is for stabilization. Then, it’s outpatient, so we have the ability to make linkages to all the major agencies, so you’re talking Horizon, Spectrum, Mid-Erie, ECMC outpatient. If we think someone can benefit from a referral to senior services, or their primary doctor needs to be contacted, we do what we can to keep the person out of the hospital, if at all possible. So we do a safety plan, following up. Statistically, each hospitalization makes it harder for recovery the next time, so the goal is recovery and hope and resiliency. We want to do our part to make that happen. How do you move on after you lose a family member to suicide? Over time, you realize anything can happen at any time, so I need to live the best life for me. You only get to do this one time. Why would you want to be miserable?